Ask any CEO or top company manager, “What is your biggest headache?” and they’ll likely tell you, “Managing people.” One popular solution management gurus have come up with is to treat your business as if it were a school – and a lot of tools, such as Salesforce Community Cloud, have popped up to help you make learning happen for your employees. This strategy is supposed to make management easier because the process of learning and growing keeps employees engaged. But how do you make a “school” happen in reality? If you do decide to take this advice and combine your business with learning, don’t just settle for any old learning. Turn your business into a “School of Rock” (just like the movie with Jack Black!) and turn all your employees into rockstar performers – the kind who play well together, share the stage and the spotlight, and deliver a stellar performance to your clients every time! In the movie “School of Rock,” Jack Black’s character winds up playing substitute teacher to a bunch of fourth graders who have little in common and are very unmotivated. It’s his job not only to teach them how to play music better but how to believe in themselves and prevail in the face of adversity (which is relative, of course, when you’re still in elementary school). When starting and running a business, you’re basically trying to do the same thing – take a bunch of people who on the surface don’t have much in common and motivate them to do their best in support of each other and the organization. Instead of managing a band though, your mission, should you choose to accept it, is to recruit, train and manage your employees to rock in the marketplace. If you really want your employees to shine and be truly engaged, could Salesforce Community Cloud be the right answer to your organization’s “School of Rock?” In this two-part series, we’ll take a look at 10 ways to rock your company culture with Salesforce Community Cloud. Some experts say an acceptable turnover rate is 25% annually. But with the average cost to recruit a single employee pegged at $3,000-$5,000, you would be spending $75,000-$125,000 a year in recruitment costs for every 100 employees. Ouch! Salesforce Community Cloud lets you use a use a data-driven hiring strategy to find the perfect match between job seekers and your open positions. Plus, hiring managers can use their smartphones to collaborate anytime, anywhere. Onboarding is the money you spend AFTER all the money you spent on recruitment. This includes offer creation, sending out and processing paperwork, and the cost of materials for welcome packs and contracts. And, of course, there’s administration time. If your company is growing, then the only constant is change. But how do you keep your current employees up to date with what’s new? Salesforce Einstein uses artificial intelligence to give employees access to all the information they want with autogenerated topic pages. Employees can also save discussions, groups, files, and experts in a single page. As a tool, Salesforce Einstein makes it easy follow company news updates, too. HR experts say employee happiness has a direct impact on performance. Some of the ways Salesforce Community Cloud can help increase employee satisfaction is through user Groups. Employees can create Groups that are centered around projects, their job duties, or even outside interests that bond them together. Then, Chatter makes it easier for employees to communicate with each other and even talk through issues they may be experiencing. Talking it out can be a great way to find solutions to common problems a team may be experiencing on a project, and it can be good therapeutically. Employees can feel supported and like part of a bigger community. A general rule of thumb in business is that you need one HR professional for every 100 employees. There’s rarely a shortage of tasks for HR professionals. Their work includes recruiting, screening, interviewing, placing workers, handling payroll, benefits, employee relations, and training. Phew! The Files feature in Salesforce Community Cloud lets HR managers give employees access to their personnel files (including mobile access). Files can be embedded into core business processes, such as the stages of your onboarding process. Your hiring portal could store candidate data, such as their employment history. In today’s globally driven, complex, service-driven business arena, no one succeeds on their own. Sure, Mick and Keith had their disagreements, but their commitment to teamwork led to their ongoing success. Today, new technology helps teamwork happen more efficiently and smoothly in business settings – even when workers are scattered around the country or the world. Salesforce Community Cloud helps your employees organize into online groups, which then give employees a structure for discussions and activities. Not only can you create groups for teams but also for events, marketing campaigns, and any type of project for that matter. Everyone in groups can share files, records and videos. It can make it easier to collaborate and get things done, plus Salesforce Community Cloud is completely customizable, just like the rest of Salesforce. BONUS: If you want customers or clients to interact with each other for any reason, you can create Community Cloud groups for them, too. Can’t get no satisfaction when it comes to employee innovation? Leaders only have themselves to blame. That’s because you can’t force employees to be motivated. Your job is to create the conditions under which they become inspired and motivated. Then, innovation can flourish. Salesforce Community Cloud helps to encourage the kinds of interactions that can lead to innovative discoveries with a featured called Chatter. Using Chatter, employees can share updates on company news, find subject matter experts within your company to support them on their projects, and problem solve with others across your org if they get stuck on something. Chatter is an easier way to let more people contribute more ideas, which should in turn help you foster a more innovative workplace environment. HR experts will tell you employees must be engaged. But what exactly does that mean? The Rolling Stones engaged millions by being at the vanguard of a new type of musical expression – an expression that gave voice to new cultural attitudes that were emerging at the time. If you want your employees engaged, you need a system for engaging employees, helping them engage each other and giving them a voice for expressing new ideas and even concerns and problems. The difference of course is that the Rolling Stones grew out of the counterculture of the 1960s. Salesforce Community Cloud helps your employees engage in and contribute to your company culture. For example, the Topics tool within Community Cloud gives your associates auto-generated topic pages where they can save a range of content into a single community page, including discussions, files, and lists of resources such as groups and experts to follow, creating a sort of hub. It also gives them updates on the topics they’re following and information from the community. The speed of digital innovation keeps getting faster, as does the need for digital transformation. Starting with their “Steel Wheels” tour in 1989, the Rolling Stones used bigs screens and other high tech to reach massive arena audiences, which led to some of the highest grossing concerts of all time. Your company needs technological advances to stay ahead of the curve, too. One of the ways Community Cloud helps your employees is with their Files feature. This gives them controlled mobile access to files that are embedded in your core business processes. Further, you can make your all your files accessible through one secure location. Bloomberg News recently reported that about 3.56 million people quit their jobs in May 2018, according to the U.S. Labor Department. According to this same article, that means the rate of people who have quit their jobs is at a 17-year high (up to 2.4 percent from 2.3 percent). How is turnover at your organization? Employee turnover is a statistic you can’t ignore. It either confirms you’ve got a high-performance company culture or you don’t. A high turnover rate tells you without a doubt that your hiring and onboarding costs are too high. Not only that but your productivity and employee engagement are probably lacking, too. Just as we discussed how Community Cloud can help manage your HR hiring and onboarding costs in part 1, Community Cloud can be used to shrink your turnover costs, too. Rock on with Salesforce Community Cloud from RTS Labs! As the kids in “School of Rock” sing, “It’s a Long Way to the Top if You Want to Rock ‘n Roll.” It’s the same in business and it’s getting tougher all the time. Salesforce Community Cloud gives you the tools for turning your company culture into a competitive advantage with tools for more efficient recruitment, smoother onboarding, improved employee communication and on-going learning. Thinking about checking out Salesforce Community Cloud so you can make your culture stronger – and out rock your competition at the same time? Partner with RTS Labs to try out a Community Cloud solution that fits your unique company culture. We can talk through the pros, the cons, the hurdles and the wins for your organization. Just reach out to us to start the conversation. Thinking of customizing any part of Salesforce on your own with an in-house team? 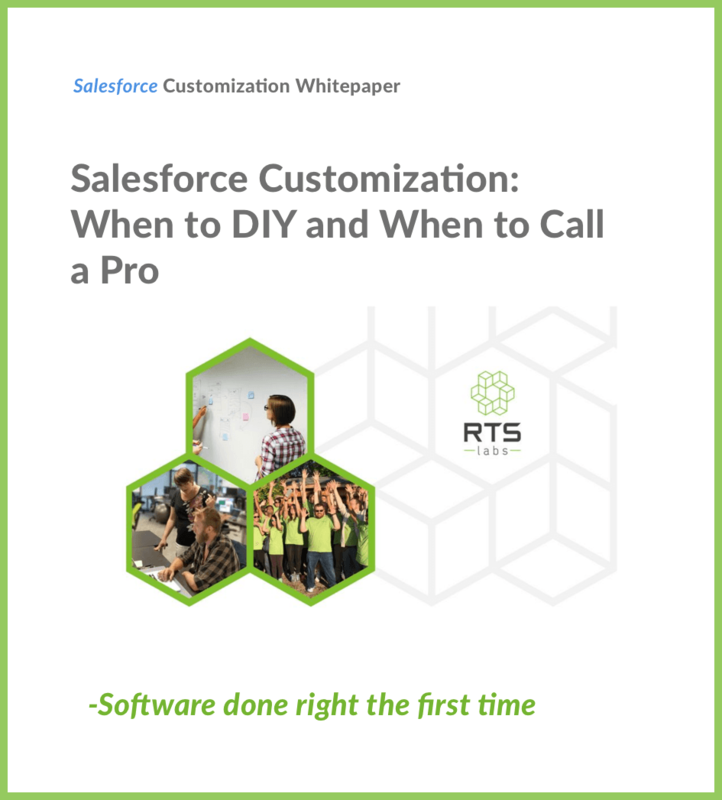 Check out this whitepaper first to find out if you should attempt to DIY your Salesforce customization – or call in professional help. Will doing a DIY job on your Salesforce customization really save you money? Read this whitepaper to find out. Almost there! Please complete this form and then click the button below for the download to begin. © Copyright 2017 RTS Labs. All rights reserved.